The thought of learning a new musical instrument can be so exciting, but actually going into the market and looking all of the instruments can make you stop and take a few deep breaths. It’s so overwhelming when you have so much variety available, especially if you are a novice who knows very little about what one should look for in a violin. You may have come across the Cecilio CVN-300 Violin in one of your online or offline searches for relatively cheaper and good violins for beginners. We are here to review it and list down some of its features, all the pros, and cons that we think it has so that you can better decide if it suits your needs. Fittings Details Made of ebony and used for pegs, fingerboard, tailpiece, and chinrest. Who is the Cecilio CVN-300 best suited for? 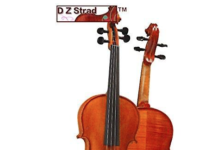 This violin is suited for beginners and intermediate players alike, who do not have a lot of professional needs. If you are looking for a pocket-friendly investment that will last you for a good couple of years, then we would definitely recommend looking into the Cecilio CVN-300. 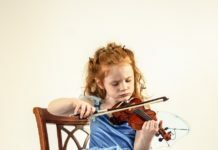 If you are a beginner level violinist, then you probably are not ready to invest a lot of money into your musical instrument just yet. When you’re just starting out, the Cecilio CVN-300 is a great violin for you because of the value it provides for an affordable price. Available at the price of only $129.99, it is much more pocket-friendly than a lot of its competitors with the same specifications and features. Cecilio Company was founded solely with the purpose of making high-end instruments available to people at a lower price. What’s more is that because this is a standard ebony, maple and spruce constructed violin, it is guaranteed to last a few years without needing to invest in another instrument again. Because of the aged maple back, the ebony sides, and spruce top, the Cecilio CVN-300 is durable and sturdy. 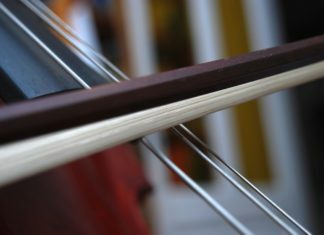 The woods used in the construction of this violin undergo an aging process, after which they attain their maximum sturdiness and only then are they cut, refined and used for the making of violins. This ensures maximum durability. Additionally, the case also comes with a durable shell, providing extra protection for the instrument. 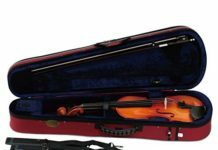 Usually, with violins of this price range, the manufacturers just add a softer case that does not protect them from abrupt knocks and bumps. The violin is constructed from lightweight materials which make it easy to hold during long rehearsals. Additionally, the violin outfit comes with everything you need to get started so it is ready to play out-of-the-box. 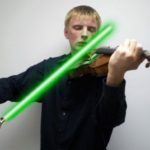 Since this is a beginner instrument, there are certainly some cons to be aware of. One of the most frequent complaints has been that it needs to be tuned often. This package comes with an electronic tuner, but many beginners are less qualified to tune their own instruments. The package comes with D’Addario Prelude strings which should be upgraded. 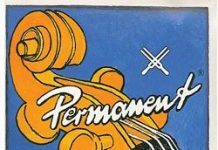 Many players have found success replacing the Prelude strings with Dominants for a better sound. 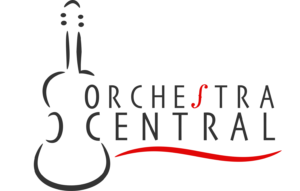 For other violin string options, check out our guide on the best violin strings. There have been some complaints about the strings being delicate and if tuned too tightly, are likely to snap. However, we find this to be true of most violins and the Dominant strings won’t have this problem as regularly. Also, under a careful hand this can easily be avoided. While this is a great investment for beginners, the same might not go for advanced players. This violin is custom made to suit the needs of a novice, and if you are a professional player you may find that many of its qualities are not to your liking. For a more advanced violin, see our guide on the best violin brands. In that case, you might want to look for a different, more expensive and better quality violin. Remember that this with a violin of this cheap a price, you get what you paid for. 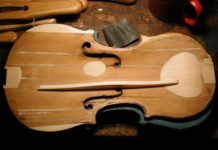 The materials that count for the most in the construction of a good violin primarily include the quality of the wood used for the top and bottom part. 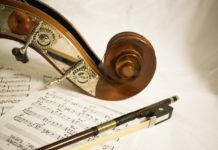 Kinds of materials in other parts of the violin that have an impact on the quality of the sound it produces include the tuners, the tension in the strings, the case in which it is encased and the bow. The body of the Cecilio CVN 300 is constructed out of maple, ebony, and spruce collectively. The sides and the back are made from a mature maple. It is further lined by ebony fittings and topped by aged spruce. Where maple ensures the resilience of the body, the delicate spruce guarantees an efficient transmission of sound. Both of the woods used undergo adequate aging before use. The bow is perhaps the most delicate part of this violin and needs a careful precision of the handicraft. The Cecilio CVN 300 brings with itself two bows that have been made from beech wood and unbleached horsehair –a combination that most professional violinists chose for their own selves. 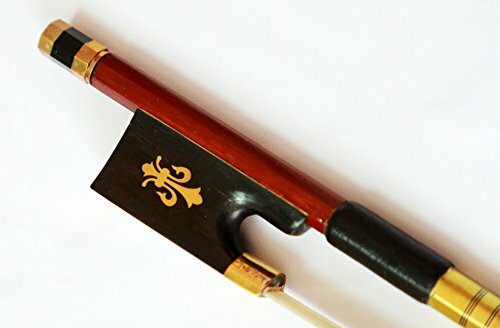 The pegs, fingerboards and other fittings that provide cushioning to the parts of the body that the violin rests on, are made of ebony, that can is soft but can also stand constant rigorous motions of the strings and bow. Where most violins of this price and specs offer a softer, foamier case, the Cecilio CVN 300 comes with a durable shell that guarantees safe transportation and shock-recovery from any sudden bumpy hits. The Cecilio CVN 300 package includes not just the violin, a tuner, and two bows but also two bridges and a DVD, CD and lesson book to help you get started. Additionally, it comes with a 1-year warranty to cover up for any defects and various other issues. The company is known for providing a no-questions-asked customer care when dealing with instruments under warranty. At Cecilio, great commitment and investment go into crafting high-quality orchestra-level musical instruments to aspiring learners at an affordable price. The idea is that everyone should be able to freely immerse themselves in the beautiful world of music, alongside top-class professionals, and create art. That good quality instruments and educators should not be accessible to only the rich. And with this noble idea, Cecilio Musical Instruments offers high standard musical instruments, inspected and re-inspected in every manner, and tested in all their overseas factories. Care for a Video Review? The Cecilio CVN-300 has been specially crafted to suit the needs of a beginner violinist, trying their hands out at creating beautiful art. It has been made by a company that puts its customers first, and whose prime purpose is to give high-end, top-quality, musician-recommended instruments to people who want to enter the world of music. It is an overall cheap violin, which is strong but lightweight, and easy to play for the eager student. Plus, because quality materials have been used in the making, it will surely last you for years to come. In our opinion, it is definitely worth a consideration.